Shrinking Kitchen // Main Dish // Beef Recipes // Quick and Easy Taco Soup in Under 30 Minutes! 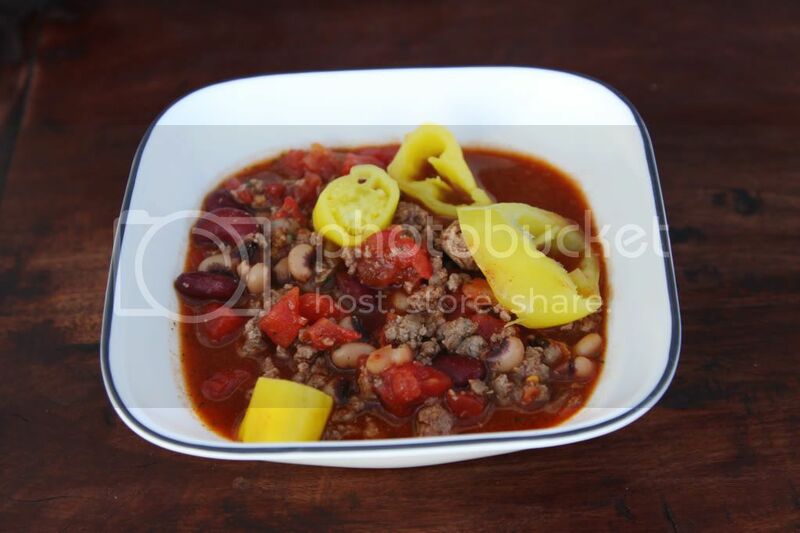 Quick and Easy Taco Soup in Under 30 Minutes! This is my simple, go-to recipe when I need a delicious meal in a pinch! Seriously, folks. It doesn’t get easier than this! Sure to be a household favorite! You can use any beans you have on hand, including chili beans. I love to add mild banana peppers on top of my soup. The kids enjoy a sprinkling of cheese on theirs! Combine all ingredients (drain beans for less sodium) and simmer for at least 15 minutes. 224 calories, 10 g fat, 4 g fiber per serving. It tastes awesome with any kind of beans, although I don’t think I have used black yet. Let me know how it turns out! Wonderful! This recipe served a dual purpose…healthy eating & pantry raid! I love that I didn’t have to go to the store. Used black & kidney beans along with left over pot roast…DELISH!!!! I made it tonight using the black beans and ground turkey instead of bround beef. It was very good but spicy! Even our 4 yr old tried it, Tom just told him it was chili, he ate some but it was too spicy for him. Thanks. Tom loved it. Yes, it is spicy!! You can tone it down a bit by using “mild” Ro-tel instead of original! Glad the hubs loved it! Just found this on pinterest. I had to laugh at the “drain beans for less sodium” instruction. Have you ever looked at the sodium content of a packet of taco and ranch seasoning? And holy cow, Rotel has SO much sodium. lol! Draining your beans are the least of your sodium concerns. I’d love to hear your substitution suggestions. Thanks! This was my grandmothers favorite!!! She added a can of hominy and a can of corn too! And of course cuz were in the south, cornbread! Good memories! Thanks! Made is tonight with pinto and black beans and ground turkey because that is what I had on hand. Also used homemade taco and ranch seasoning mixes. Very good, the whole family liked it – even all three kids. I made this with some canned goods and mostly leftover chicken and some turkey sausage, plus some leftover ranch pasta salad and sauce from a taco chicken , I prepared in crockpot.